Andrejs Rubins (born 26 November 1978 in Riga) is a Latvian former football midfielder, who last played for the Azerbaijan Premier League club Simurq PFC. He was also a member of Latvia national football team. Currently, Rubins is the assistant manager of the Latvian First League club FK Ogre. Rubins started his career in 1996 at FK Auda in the Latvian 2nd Division. The following year he moved to Sweden with Östers IF, where he made 11 league appearances before moving back to Latvia in 1998 to play for Skonto Riga. He played there for the next 3 seasons and managed to win 3 consecutive league titles in a row and also won the Latvian Cup twice. All in all, over those 3 seasons he helped his team, scoring 14 goals in 67 league matches. In 2000 Rubins moved to England, joining English Football League First Division club Crystal Palace. He made just 31 appearances in three seasons at the club but still managed to impress, scoring twice in the League Cup against Leicester City and Liverpool. In June 2007 he was linked with another loan move, this time with English Football League Championship club, Blackpool,  but he eventually went on loan to the Latvian Higher League club FK Liepājas Metalurgs on 27 July for six months. He was released by Metalurgs together with his international team-mate Imants Bleidelis after half-season for unexplained reasons. 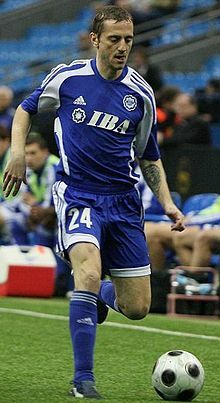 Bleidelis retired from professional football then, but Rubins signed a contract with the Azerbaijan Premier League club Inter Baku in August 2008. He spent two successful seasons there, becoming a vital starting eleven player for the club, scoring 9 goals in 49 league games. Rubins also managed to become the champion of Azerbaijan in the 2009/2010 with Inter. He started the 2010/2011 season in another Azerbaijan Premier League club FK Qarabağ from Agdam, joining on a two-year contract on a free transfer. Andrejs suffered several injuries that caused limited game time and he only managed to appear in 12 league games and was released at the end of the season. In 2011, he was signed by Azerbaijan Premier League club Simurq PFC. Rubins scored 1 goal in 18 matches for the club, and in July 2012 he was released. Struggling with a long-term hip injury, Rubins announced his retirement from professional football on 13 March 2013, saying: "If I cannot play for 100%, that's not worth it." After his retirement Rubins started coaching kids and youngsters in Ikšķile. Prior to the 2014 Latvian First League season Rubins was appointed as the assistant manager of FK Ogre. Rubins made his international debut for Latvia on 10 November 1998 in a friendly match 3–0 loss against Tunisia. With 117 international caps he is the second most capped player in the history of Latvian national team, 50 matches short to Vitālijs Astafjevs. Rubins also participated at the EURO 2004 in Portugal. ^ "Leicester 0–3 Crystal Palace". BBC Sport. 1 November 2000. Retrieved 6 January 2010. ^ "Palace leave Liverpool red-faced". BBC Sport. 10 January 2001. Retrieved 6 January 2010. ^ "Rubins wings his way to Spartak". UEFA. 10 December 2002. Archived from the original on 9 March 2008. Retrieved 3 February 2008. ^ "Trio strengthen Spartak ranks". UEFA. 12 March 2003. Archived from the original on 9 March 2008. Retrieved 3 February 2008. ^ "Rubins ready for Spartak". UEFA. 5 January 2005. Archived from the original on 9 March 2008. Retrieved 3 February 2008. ^ a b "Pool target Spartak Moscow player". Blackpool Gazette. 28 June 2007. Archived from the original on 9 March 2008. Retrieved 3 February 2008. ^ "Basinas makes Mallorca move". UEFA. 20 January 2006. Archived from the original on 9 March 2008. Retrieved 3 February 2008. ^ "Metalurgs bring Rubins home". UEFA. 5 January 2005. Archived from the original on 9 March 2008. Retrieved 3 February 2008. ^ "Premier League Stats 2008/09" (PDF). Peşəkar Futbol Liqası. Archived from the original (PDF) on 11 February 2014. Retrieved 26 September 2013. ^ "Premier League Stats 2009/10" (PDF). Peşəkar Futbol Liqası. Archived from the original (PDF) on 9 August 2012. Retrieved 26 September 2013. ^ "Premier League Stats 2010/11" (PDF). Peşəkar Futbol Liqası. Archived from the original (PDF) on 8 July 2013. Retrieved 26 September 2013. ^ "Premier League Stats 2011/12" (PDF). Peşəkar Futbol Liqası. Archived from the original (PDF) on 17 October 2013. Retrieved 26 September 2013. This page was last edited on 2 January 2019, at 18:00 (UTC).